Electrical is not my forte, so I will dive heavily into this forum shortly. I saw this at HF the other day and was wondering the pros and cons of this one. Also thoughts on units that are better or cheaper or worth the extra money, etc. I would not buy any high-current electrical item from Harbor Freight! My general rule for anything Made In China is to derate by 50%, i.e if you want a 1000W inverter buy one rated for twice that power. It will draw more standby power, but the FETs should last longer. I also use that same rule of thumb for Chinese bottle jacks, so I buy 20-ton jacks for 10-ton loads, etc etc. If you're planning to run an air conditioner from it you probably want to spend the extra on a pure sine wave unit. If not, I've used mine to run my chest freezer, various power tools, my TV, and a bunch of other crap without any problems. Ultimately I'd like to be able to power anything off grid, so more is better. Are you referring to something like this? $30 cheaper than the HF one at half the wattage. They're both 2000W continuous, the Bestek claims a slightly higher "peak" than the HF unit. The peak figure is just buffer room for devices that have a heavy burst at start. When you pull the trigger on a circular saw it's gonna very briefly take twice as much power as it takes cutting through wood just to get spun up. The continuous figure is what it is able to deliver for more than a second or two at a time. If you're looking at a pure sine wave unit those tend to cost about double so I don't normally suggest them unless you know you need one. AC units tend to have short lifespans with modified sine wave inverters, which is why I call them out specifically. It will work on a modified sine wave unit, it will draw a bit more power than if it was on a pure sine wave unit, and it will have a shortened lifespan. But most everything else won't care. Besteks are also made in China. Seems like a better unit for less money so I would opt for it over the other. The Bestek doesn't say in the details whether it is sine or pure sine, which I don't understand the difference yet. Doesn't mean a lot when you're running from alternator power, but if you were on solar it's really wasteful to charge a laptop from an inverter. You're taking DC power from batter and converting to AC in the inverter, than back to DC in the charger brick. You'd save a lot of power skipping those conversions and just boosting you voltage. Bestek is from china for sure. I'm comfortable recommending it because I've been using mine for almost 2 years. 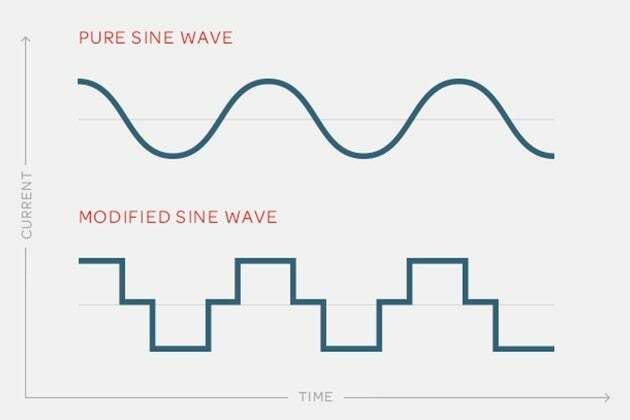 If it doesn't explicitly say pure sine wave, it's modified. The power in your house is a pure sine wave. Technically, it's better. From a practical standpoint, it rarely matters.